In previous articles, I shared boxing tips, leaving the corner well, rating and turning on the fence. All that’s left now is to “circle up”. There are some strategies for circling like all the other phases of the fence work. Let’s say you’re going down the left wall, away from the out gate, and you’re ready to circle. You can get right behind the cow, tight on the wall, so it’ll see wide open arena, and come off the wall for you. If it does that, and turns sharply back on you (as in 170*) so it’s heading to the out gate, your best option and shortest path, is to double back and “pick the cows head up” and circle to the left first (counterclockwise). If it came of the fence at 90*, straight out towards the center of the arena, you could go either way first. If it only came 30* off, so it was still travelling away from the out gate, you’d want to get between the cow and the fence and circle right (clockwise) first, so you didn’t circle it right back into the fence. If it doesn’t peel off the fence when you’re right behind it, jump in front of it again, turn it quick and using the ideas from above, choose the best way to circle first. Always go at least 370* around, in position of control, before changing sides. If you go less that 360*, it will be hard to credit that set of circles, and you might have to come back and circle that way again. What I mean by that is, if you go 340*, switch sides and circle the other way, and you don’t hear the judge’s whistle, go back and do the first way again. The judge didn’t feel that you satisfied the requirement for the first set of circles. More judges these days, will just deduct a bit for that first set. They figure you chose to do that, so that’s what they’ll mark. When circling, try to get your horse’s nose all the way up to the cow’s ear. Lot’s of horses know the drill, and they want to lean on the cow at the hip or rib, because it’s easier than getting all the way up where they belong. It’s very easy to knock one down, when trying to force the cow at its hip or rib, and that’s expensive (-3). When you do switch sides, always be sure your cow is heading out towards the center of the arena, so you won’t lose it to the fence (-1). And then, come right up beside it, all the way to the cow’s ear and circle it the new way, until you hear the whistle. It might be hard to hear with all the screaming and clapping that’s sure to be going on as you finish up!! Pull up, take a deep breath and pat yourself on the back! 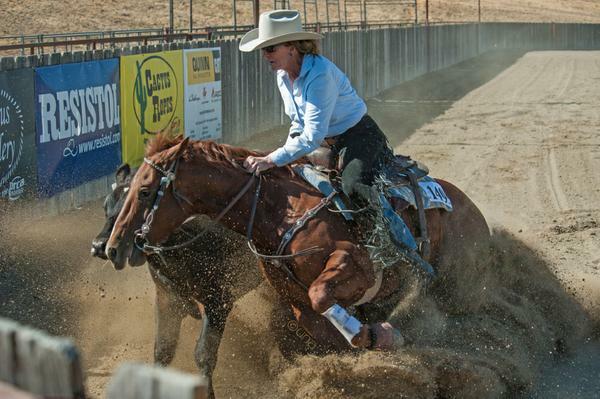 You’ve just finished one of the most exhilarating things you can do horseback. 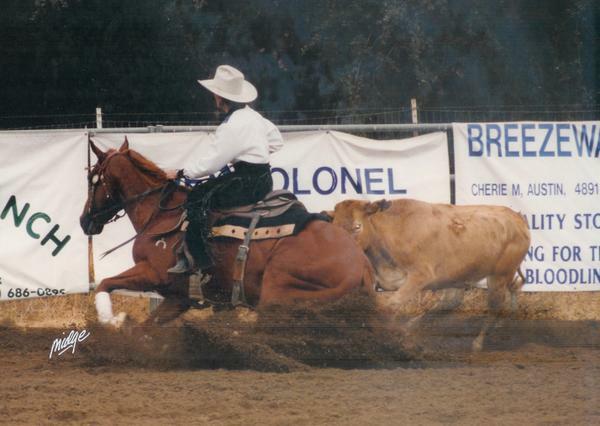 Below is a photo of my “fence mentor” Lyn Anderson in perfect circling position! Bowing out toward a magnet. You’re on the side of the circle closest to the barn (magnet) just exactly the opposite side of the above problem. Your horse pulls or drifts toward the barn, bulging the circle out in that direction. Fix by drawing your outside rein back in the direction of your belly button, and against your horse’s neck, to stop the outward drift of his shoulder, and applying your outside leg in neutral position to correct the outward bulge of his barrel. Over-correct by making him cut across the circle. Make a sharp 90* pivot and go straight through the middle of the circle. Rejoin the circle at exactly the opposite side, farthest from the barn. Losing impulsion and focus (“wandering”). Drive vigorously with both legs in neutral position and cluck to keep him “motivated” and moving with energy. In the last boxing/fence article, I wrote about the importance of leaving the corner well and rating the cow down the fence. These two components can make or break your run. If you leave late and have to catch up, you’ll be going too fast when you turn your cow, which can cause you to be less than accurate, and your ability to control the cow will suffer. And, if you get going too quickly, you’ll turn your cow before the middle marker. Assuming that you left well, and you have rated your cow down the fence, now it’s time to sneak past it. I emphasize the word “sneak” because you want to overtake the cow and cruise by it, going only a little faster than it’s running. This way, your horse will be focused on the cow, and able to turn right with it. He will be able to be very accurate and control the cow through the turn. In order to credit your turns, the horse must engage its hindquarters while stopping and turning the cow. This enables the horse to maintain control both in the turn, as well as upon exiting it. If your horse doesn’t engage its hindquarters, but instead turns like a Coke bottle spins, it will feel like you’re riding a buffalo. If your horse drops its shoulder before engaging its hindquarters, it will feel like you stepped off a stair in the dark, that you didn’t know was there. Both are hard to ride and even harder to control the cow when exiting the turn. So, as you sneak by, you’re watching the cow like a hawk. You have him in your crosshairs. Try to slow time down, and focus, so you can see the imperceptible drop of the cow’s head or the blink/roll of its eye. This is the cow “setting up”. 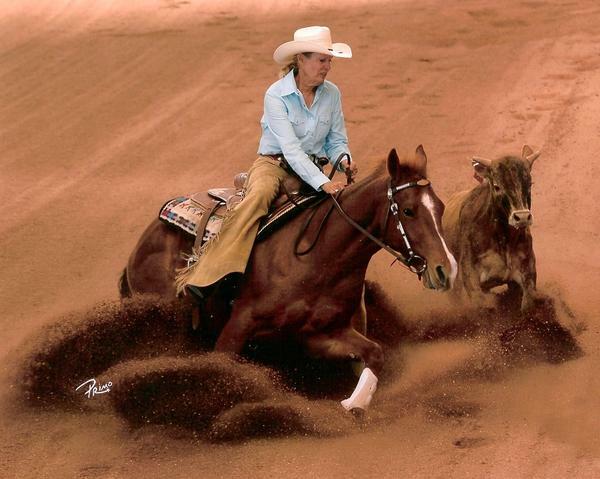 Real cowy horses can see this, as can real cowy riders. 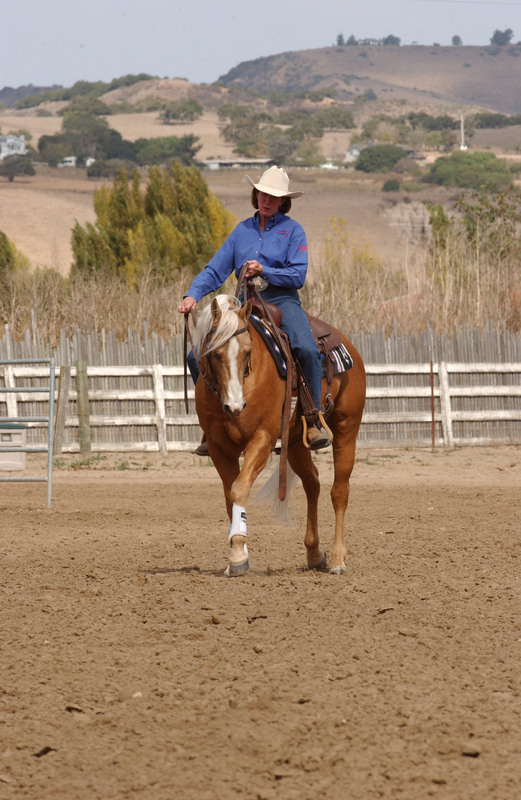 That’s when you sit deep, think core, drawback on your reins to initiate the stop, while pulling the cow side reins a bit more. This ensures your horse gets on his hocks and goes all the way through the turn nose first. That way he won’t get hung up on the fence. You want to be very accurate, read the cow all the way through the turn, and exit right with it, in control. Then, with it either on the fence, or requiring you to shape it back to the fence, you set up your next turn, and cruise by, never taking your eye off the cow’s head. What if things didn’t exactly go as planned? If you made your first turn, and the cow came off the wall for any number of reasons, you might opt to make the “California Loop”. To do this, assuming you’re on the left wall, you would need to loop your cow around counterclockwise, and then head back down the fence to get your right turn. This would set you up to be on the fence most of the way down the arena, giving you a better shot at a good turn. If the cow came off the fence and you had to loop, the question is, “did you lose control/working advantage, so the cow came off the fence?” If you did, there will be a 1 point penalty. If not, then there shouldn’t be. If you opted not to do the loop, you would head back towards the out gate, and try to shape the cow back to the fence, in hopes of having it on the fence before you ran out of the arena. It is a higher degree of difficulty to do that, so if you pull it off, you should get more credit for it. Let’s say you executed a good left and right turn, it’s safest to take a third turn before circling. This will ensure the best placement in the arena to circle and decreases the possibility of getting outrun when you start to circle. For the next fence article, I’ll go over circling. Hope this gave you some good ideas! 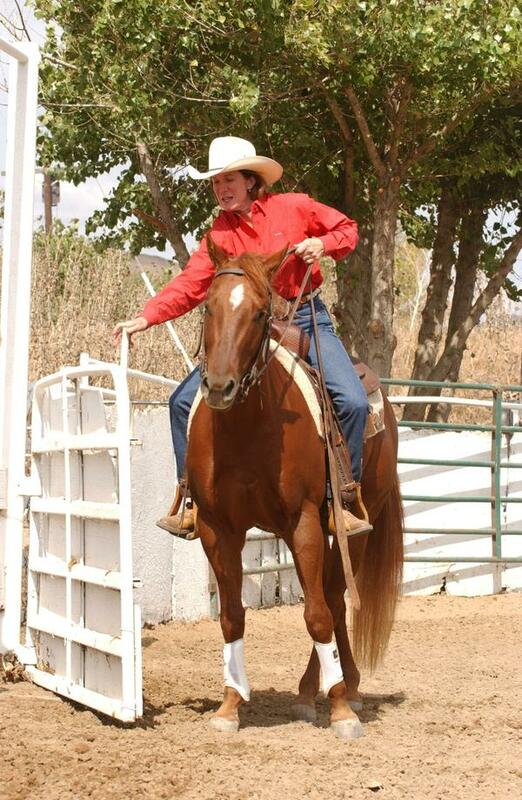 Below is one of NRCHA’s great non pros, Shannon McCarty! 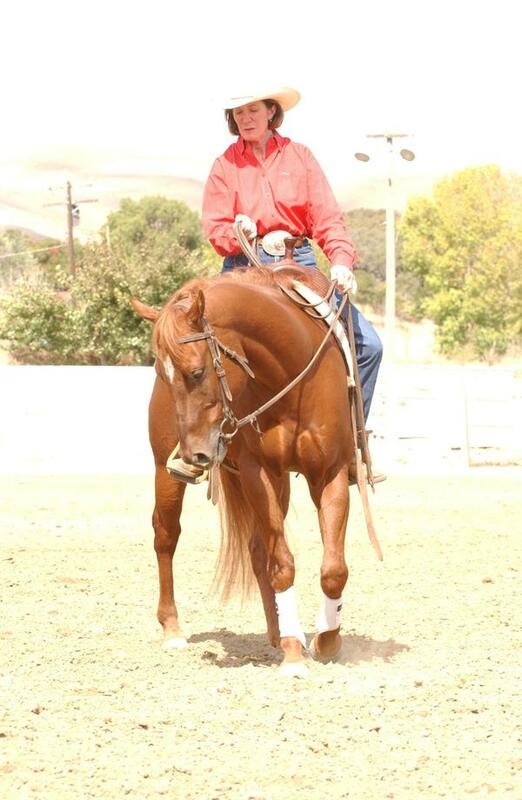 In a previous article, I covered Reining Essential 1 (giving his face). When your horse is responding well to that, begin work on Essential #2, walking a perfect circle. This one sounds easy, but it isn’t! 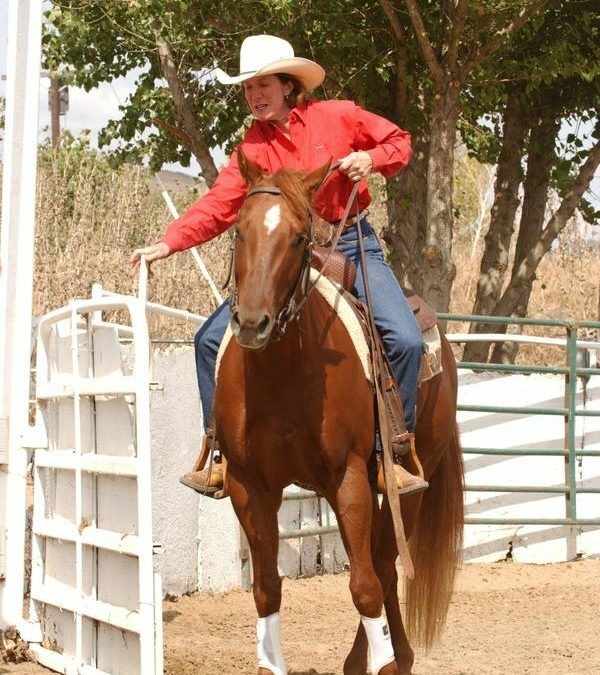 Once you achieve it, you’ll understand the basics of maintaining control over your horse’s entire body. Perfect circles will serve as the foundation for the circles and spins you’ll see in all patterns. In perfecting your circles, you’ll also discover and overcome your horse’s magnets—that is, the things (like the barn or the trailer or his buddies) that draw him from the circle you have in mind. A perfect circle is a symmetric circle, meaning precisely round as opposed to oval, oblong, or egg-shaped. 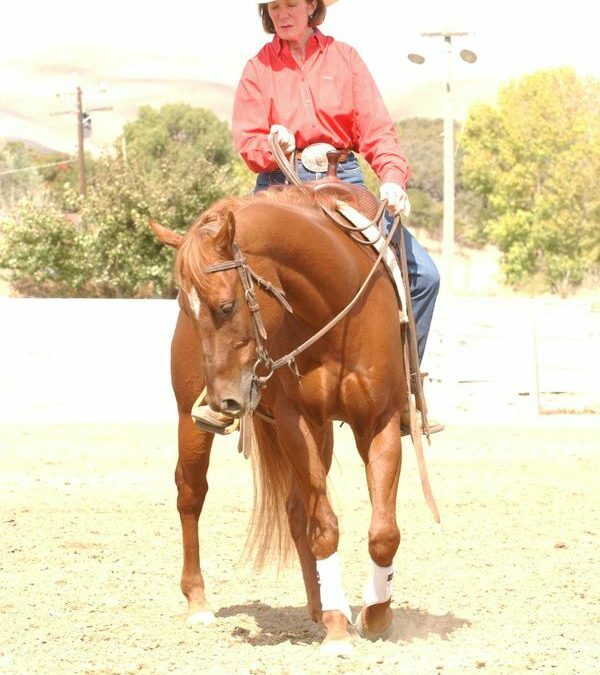 As your horse travels this circle, he should stay soft in your hand and flexed slightly to the inside through his neck and body, with no deviations in speed. His hind feet should follow in the tracks of his front. He should be equally soft and responsive in either direction. TIP: Work on freshly groomed ground so you can easily see your horse’s tracks. 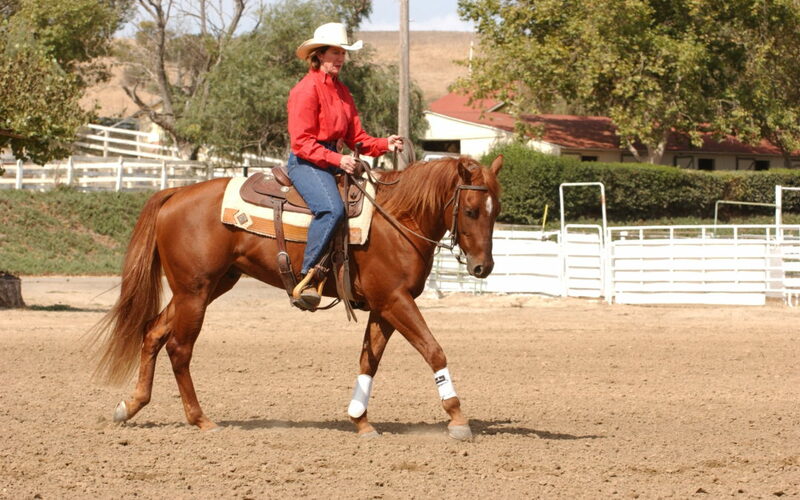 Walk your horse forward, using both your legs in neutral position to move him in an energetic rhythm. Keeping both your legs active, and with your hands 12 to 24 inches apart, apply light, direct-rein pressure on what will become the inside rein to tip his nose to the inside of the circle (so that you can just see the corner of his inside eye) and begin the circle. Use leg pressure and the outside rein as needed, to keep the circle round. Horses tend to be asymmetrical; going to their “hollow” or right side (clockwise), they tend to bend too much. Going to their “stiff” or left side (counterclockwise), they tend to resist bending. You’ll need to compensate for this and help them become ambidextrous. Circling to the right, your horse may tend to tip his nose in easier and bend too much, cocking his rear end into the circle while the circle gradually enlarges (see Diagram 4). Circling to the left, your horse may tend to resist bending, keeping his body relatively straighter and resisting bringing his nose to the inside (see Diagram 3). Instead, he’ll lead with his inside (left) shoulder, letting his hind end drift out while the forehand somewhat collapses the circle. To correct this, pick up his inside shoulder with a move I call “key in the ignition.” (See photo 2) Bring your inside (left) rein hand close to his neck, then twist your wrist as if you’re turning a key in an ignition, so that your palm comes to face upward, making your pinkie finger closest to the neck (do not bring your hand over the neck or withers, a common error). This tightens the rein slightly while giving a “lifting” motion that helps lift the shoulder on that side. 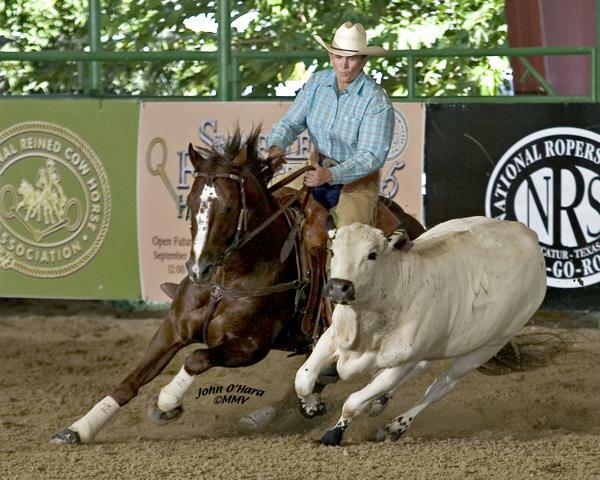 At the same time, apply pressure with your inside (left) leg in neutral position (that is, directly behind the cinch) to encourage more bend, while pulling your outside (right) rein slightly outward to the right, moving his shoulders out to the right to help stop the forehand from collapsing in on the circle. 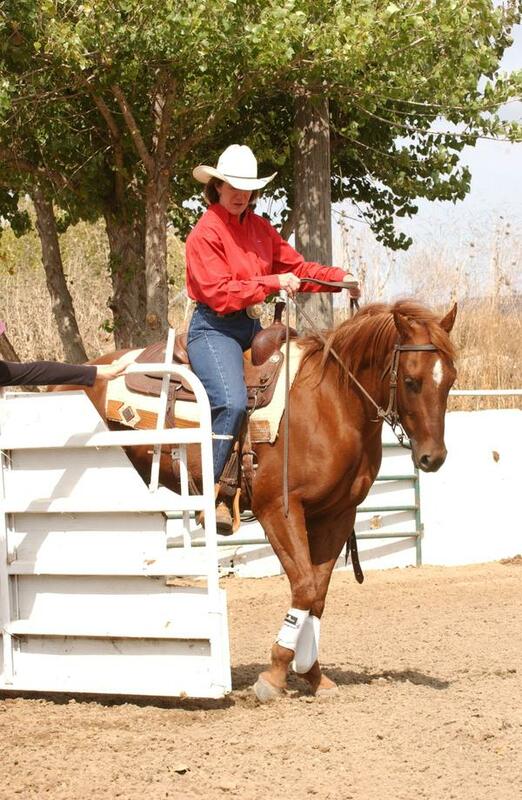 If necessary, use your right leg a few inches behind neutral position to keep his hindquarters from moving out. As you strive to keep him aligned to the arc of the circle in either direction, remember also to keep him giving his face (that is, staying soft to your hand) and using both your legs to keep him moving forward at a steady pace.